Running a blog is far from being the hardest job in the world, but that doesn’t mean it’s not challenging. Bloggers constantly run into a number of problems. For example, insufficient data on desired subject or outdated information presented as accurate can lead to the loss of authority among the audience and damage a blog. But while being less serious, the problem of “not knowing what to write about” is still the biggest one. We’ll start with soome basic advice for those who never ran into this problem before and move on to more complex and very efficient solutions. One can argue that a professional will always find what to write about. But the problem is that most of the readers are not professionals. Deep analysis of CPU structure wouldn’t work great for a blog about PC Gaming, and Research about the history of DNA testing wouldn’t appeal to the readers of a health blog. So where can you find topics that will satisfy the needs of your readers? Google trends is a nice place to start looking for inspiration. But it only works for blogs that don’t set strict boundaries in terms of subject. Even selecting a Category and location gives a pretty wide range of results, so you still have to be lucky to get something related to your niche. Setting the category to Sci/Tech and location to France gives results that hardly can fit in one blog: If you’re looking for more precise local results – speke.co is a great tool for browsing trending topics. 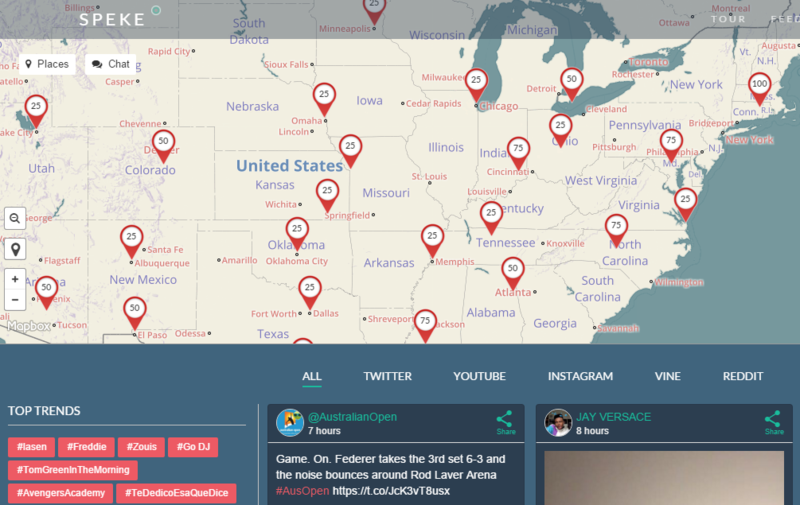 It gathers information from Twitter, Youtube, Instagram, Reddit and Vine. It may sound ridiculous, but using a calendar can not only help with finding new topics, but with creating a content plan tool. It’s a real gold mine for SMM when it comes to daily posts. Obviously, we’re not talking about a regular calendar here. Wikipedia comes to mind first, it has huge lists of noteworthy events for each day of the year. Finding a topic that will fit a blog with strict guidelines still requires some luck, but it’s much easier to find a topic when you have this much to choose from. 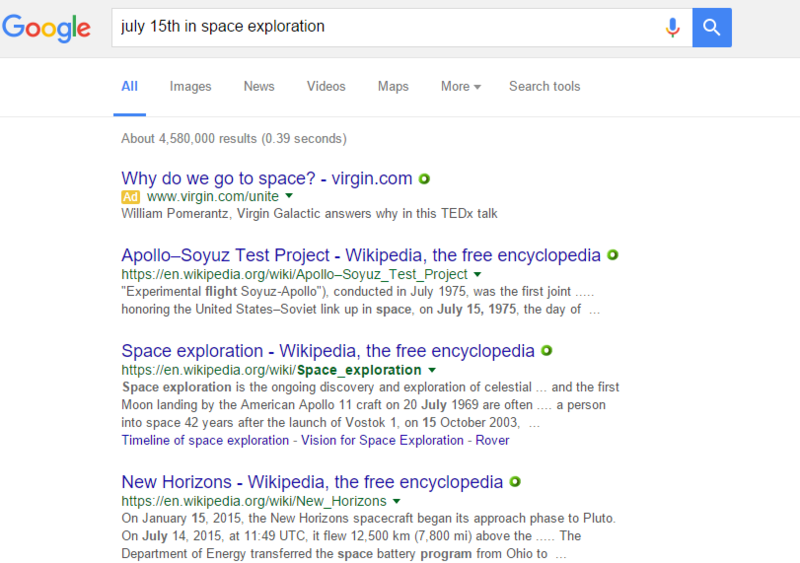 Alternatively, you can google a date and add an area of your interest to it, for example “July 15th in space exploration”. Spend some time researching the upcoming dates, find interesting events tied to these dates and you have a content plan on your hands, not the best content plan, but still. Keyword research tools, like Serpstat, gather and store search data from Google (and other search engines), allowing you to know exactly what your audience is looking for. You can find search queries related to your blog by researching your most common keywords, your domain or the domains of your competitors. Search queries may not sound like the best source of ideas for a topic, and it’s really not, if you use google’s search suggestions: This is why tools like Serpstat are the best for the job. 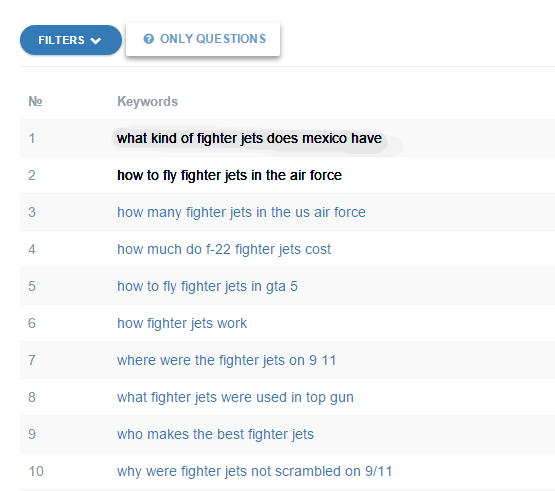 Serpstat has a filter that shows the search queries in forms of questions.These questions are a great source of subjects to discuss. Let’s find some topics for three random subjects: Fighter Jets, Playstation Games and Digital Marketing. Enter your subject into the search bar and hit search. You’ll get a detailed report on the keyword you entered, take a note of the number of monthly searches and competition. To find questions, related to your keyword, go to the Search Suggestions menu and click “Only Questions”: This is the list of questions related to our first subject: As you see, there’s plenty of questions to choose from. Add some creativity and you have following topics to cover: “What Jets do Different Countries Use?” or “Where to start if you want to be a fighter pilot.” Repeat the process for other subjects and see which results you get. 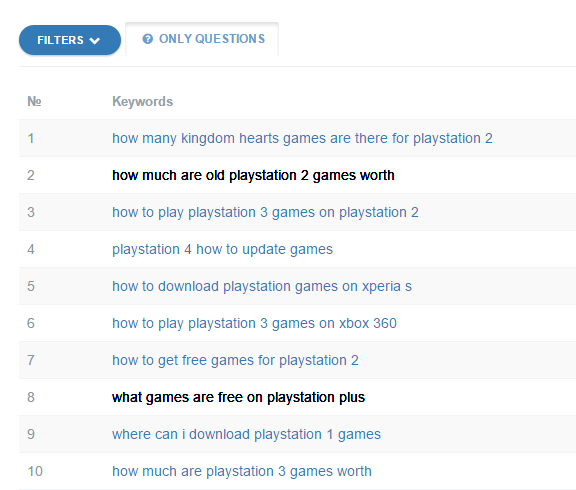 Search suggestions: Possible topics: “Rare Playstation Games and their price, you might be unknowingly rich” – List and description of collector’s items related to Playstation; “Our favourite Free games from Playstation Plus” – list of free PS plus games with reviews and recommendations. Search suggestions: Possible topics: “How to choose a digital marketing agency, 5 signs that you won’t get screwed” – guide to choosing a proper agency; “Is digital marketing cost-efficient?” – a research or a case study. While you’re looking up the questions on Serpstat, you might as well do additional keyword research to optimize your content and improve your chances to rank higher in search. You can also find related or similar keywords to freshen up the article. Most popular keywords are not that valuable for a writer who knows his subject, as they are widespread and often mandatory. To find keywords that are just right, use Serpstat’s filter. 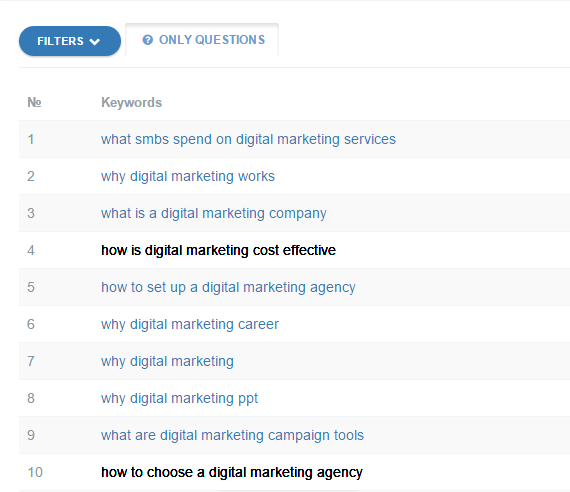 You can set it to show keywords with low level of competition and decent monthly search volume. Use the keywords that you find fitting as subheadings, for example article about Fighter Jets of Different countries would benefit if Russian Air Force had a separate paragraph, as it has a high search volume and Arms Race between US and USSR is an extremely popular topic. We don’t encourage keyword stuffing, pick a couple of keywords to add to your content, make the text readable and don’t try to impress the search engine. VP of Marketing at Serpstat.